We encouraged attendees to tweet with the hastag #nps3 during the symposium. We’ve collected a summary of the event through twitter, a big thank you to everyone who narrated the weekend! @brendadada #nps3 Side Gallery’s incredible archive including John Davies’ and Sirkka’s pictures of my village, emotional morning. @chazzoh #nps3 paul seawright – so many layers of thought and discussion in initially quite simple photos. isn’t photography fantastic?! @emmaphotoworks Interesting last talk at #NPS3 on funding cuts and does the photography network need an agenda? @BusyBetsy It’s been a very inspiring #nps3 weekend. Thank you to all the wonderful people who took part. It is hard to wind down from it all. This entry was posted in General posts on May 24, 2010 by admin. Can I Have My Mobile Phone Back Please, Officer? A quick recce for a portrait location in the City ends in police detention under s44. I spent the weekend in Derby at the National Photography Symposium and was involved in a panel discussion on ‘Photography, Security and Terrorism’. How ironic that my first assignment back in London today saw me experience again the public humiliation of a detention and a physical search by a City of London police officer.Scouting for a location on London Wall for a portrait of one of the architect’s responsible for the City’s changing skyline, I went to One Aldermanbury Square. Loaded with a Canon g10, I wandered around the base of the building taking recce shots. A guard employed by the building waved his hands at me, asserting that I couldn’t photograph this building. As I stood on the pavement opposite the building I told him he was wrong, and I had every right to photograph, which I kept on doing. Another guard approached saying the same thing, and that if I didn’t move he’d call the police. (He recognised me from a previous occasion when he had warned me off, which had also resulted in a police response. On that occasion they were satisfied that I was within my rights and I had done nothing wrong. Thus the security guards had prior confirmation from the police that I was a photographer, not a terrorist.) I wandered back and forth, sizing up my locations and where I would place my subject. I walked along London Wall high walk, and saw the frenzied police activity below. Four officers had arrived and were in animated discussion with the guards. A police van with flashing lights sped out of Wood Street and eyeballed me, fixing my position. Uniformed police approached me from both directions. I continued walking and photographing. PC 374 walked towards me and greeted me with a cheery ‘Hello’. I responded in like fashion and continued to walk on as he spoke into his radio. He stopped me with his hand firmly on my chest. I asked if I was being detained. Why? ‘If you’ll let me finish’, he responded. ‘And you are’? He inquired the way a school bully might query anyone on their patch. I said that I’m in the City, an area of iconic buildings and fascinating historical sites, that’s why I’m taking photographs. He replied with a cryptic answer:’You’ve just explained it.’ I looked puzzled. I explained that being in a public space I could not be prevented from taking photographs. He said the guards were wrong in trying to stop me. I felt relieved and thought that the whole affair would rest then and there. As I began to move away a second PC, PC29 moved from behind and took both my arms, preventing me from moving. PC 374 then told me he was searching me under s44, and he began to go through my pockets and pat me down. My phone was taken from me. The camera hanging around my neck was carefully removed and placed out of my reach. I asked several times if I could record this incident on camera and was denied this right, being told that under s44(2) I must do as ordered. The power was now in their hands. Mine were still being held. PC went through my pannier, flipping through personal notebooks, gingerly peeking in a plastic bag that contained a towel and swimmers, still wet from my earlier swim. He located my wallet, and pulled out my drivers licence with obvious glee. Each time I attempted to move PC29’s grip on my arms became firmer. I moved to zip up my jacket, which had been unzipped in the search, and his grip tightened. I explained I was getting cold and would like to warm up. He agreed, but kept hold of me by one hand. I tried to move left or right and he blocked me. Repeated requests for my phone and camera were turned down. I asked to get pen and paper from my bag, and this was declined. I said I wanted to record the incident, only to be told that I will get their record at the end of the procedure. Many times I asked why was I being stopped under s44. The answer I given was because of my obstructive and non-compliant attitude. Based on this observation, it then became necessary to treat me as a potential criminal suspect. I noted that s44 could be open to misuse, as it was so powerful and sweeping. PC374 replied ‘It has been said, but it is open for our use’ The implication being that it can be used on anyone who is non-compliant. Waiting for the data base to give PC374 the all-clear on my record, I was kept hemmed against the barrier by PC29, repeatedly told that if I kept moving I would be handcuffed. This scene of public humiliation, as I was restrained and treated like a criminal, was watched by workers from the neighbouring building. Once the all clear was given, PC374 tore off the pink slip of the s44 stop search form asking if I wanted it. I asked if I could carry on taking photographs, he turned his back on me like a petulant child, forgetting that his cap lay on the ground in the spot he had removed it earlier. Joined by a third PC, the posse then turned their back on me refusing to answer any further questions from me. I watched as the three of them walked away from me, with my mobile phone. Excuse me I called ‘Can I please have my mobile phone back’? This entry was posted in General posts on May 10, 2010 by admin. Today is the day in more ways than one. As I type this, the nation is a little uncertain as to how the country is going to be governed after this morning. 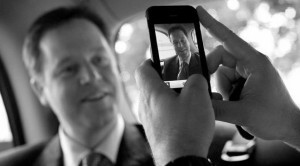 Cleggmania fell short of delivering and now the Digital Economy Act looms ever greater. It’s the early hours of the morning the TV pundits are wondering whether deals will be made or a minority government will limp ahead. On the brighter, perhaps more hopeful side, a collective of image makers will be descending upon Derby for the National Photography Symposium 2010. 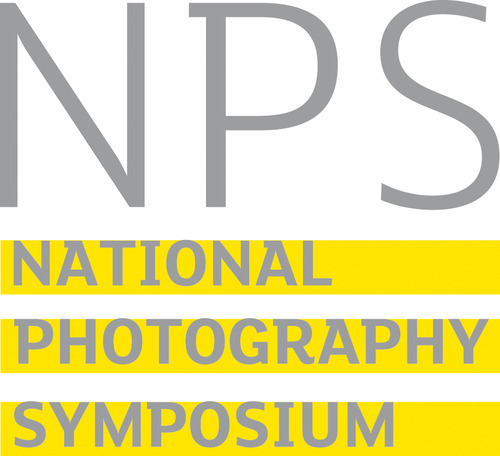 It’s the second national photography symposium by Redeye and Format and proves to be a very interesting event indeed. Not just because politically themed conversations will no doubt lace the day but because there will hopefully be other uncertainties eased and inspiration nurtured. My job today will be to talk about new opportunities in New Media. Especially within social media. How photographers can not only become more sociable with their media but how perhaps they can evolve the way they capture images and share their stories. Nurturing your niches as well as your networks will enable you to thrive in whatever avenue of photography you have chosen. I will be cramming a lot of info into a very small chunk of time so please stop me for a chat over the next couple of days should you want to know more If we don’t get the chance to connect in real life.. add me on any of these networks should you want to hook up in the future. This entry was posted in General posts on May 7, 2010 by admin. Have you been really moved or influenced about climate change? If so, what type of photography or what photographer, or what image? And how did it affect you? If you want to tell me about your own practice or plans, I’d also be very interested to hear more. This entry was posted in General posts on May 5, 2010 by admin. Below are three websites created to show the work of students and staff who are attached to the photography courses at the University of Cumbria in Carlisle. This entry was posted in General posts on May 4, 2010 by admin.